Bernard Howell Leach (5 January 1887 – 6 May 1979) was a British studio potter and art teacher widely regarded as the "Father of British studio pottery." Leach was born in Hong Kong and spent his first three years in Japan. He attended the Slade School of Fine Art and the London School of Art. Reading books by Lafcadio Hearn, he became interested in Japan. In 1909 he returned to Japan with his young wife Muriel (née Hoyle) intending to teach etching. In Tokyo, he gave talks and attended meetings along with Mushanokōji Saneatsu, Shiga Naoya, Yanagi Sōetsu and others from the "Shirakaba-Group." 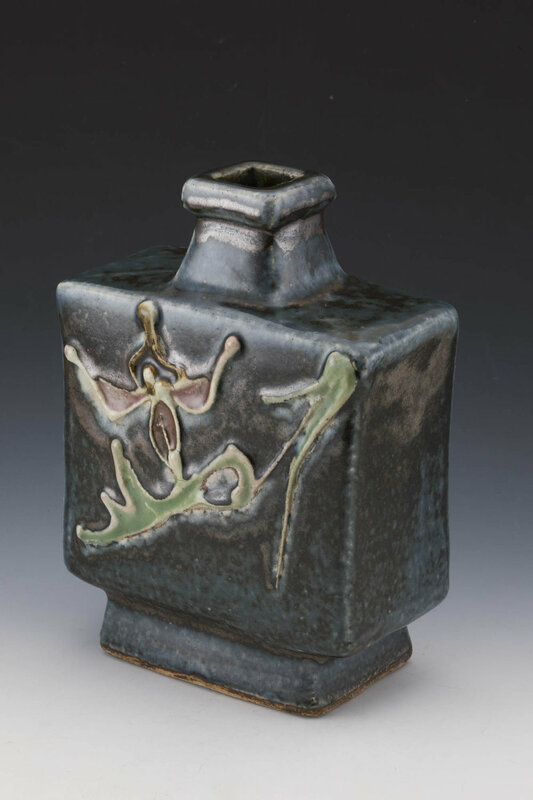 About 1911 he attended a Raku-yaki pottery party which was his first introduction to ceramics. In 1919, young Hamada Shoji visited Leach for the first time. Leach had received a kiln from Kenzan and built it up in Yanagi's garden and called it Tōmon-gama. By now well-established as a potter in Japan, he decided to relocate to England. In 1920, before leaving, he had an exhibition in Osaka, where he met Kawai Kanjiro. Back in England, Leach and his wife Muriel were accompanied by Hamada Shoji and, having identified a suitable site next to the Stennack river on the outskirts of St Ives, the two established the Leach Pottery in 1920. They constructed a traditional Japanese climbing kiln or 'Noborigama (登り窯)', the first built in the West. Leach promoted pottery as a combination of Western and Eastern arts and philosophies. His work focused on traditional Korean, Japanese, and Chinese pottery, in combination with traditional techniques from England and Germany, such as slipware and salt glaze ware. He saw pottery as a combination of art, philosophy, design, and craft – even as a greater lifestyle. A Potter's Book (1940) defined Leach's craft philosophy and techniques; it went through many editions and was his breakthrough to recognition. Leach advocated simple and utilitarian forms. His "ethical" pots stand in opposition to what he called "fine art" pots, which promoted aesthetic concerns rather than function. His style had a lasting influence on counter-culture and modern design in North America during the 1950s and 1960s. Leach's pottery produced a range of "standard ware" handmade pottery for the general public. He continued to produce work until 1972 and never gave up his wanderlust. He continued to write about ceramics even after losing his eyesight. The Victoria and Albert Museum in London held a major exhibition of his art in 1977. The Leach Pottery still remains open today, and it houses a museum displaying many pieces by Leach and his students.